While there are many versions of this recipe, some made with aborio rice and some made with wheat berries or tiny pasta, my family has always used long grain rice. 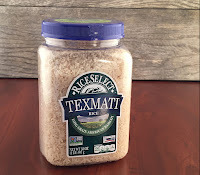 I was recently given some RiceSelect brand Texmati Long Grain American Basmati to try and immediately thought of this recipe. 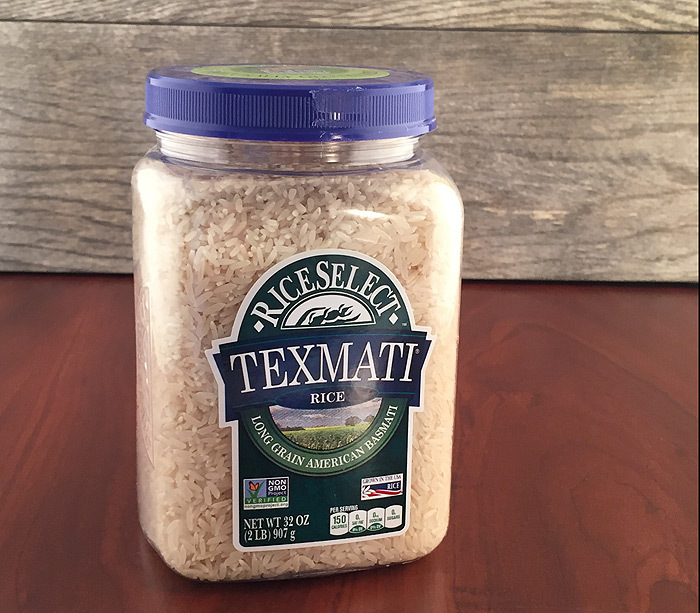 This widely recognized brand of aromatic rice is delicious on its own and when added to the pie it imparted an exotic nutty flavor and a wonderful texture. Lightly spray a 9 inch spring-form pan with butter spray. Set aside. Preheat oven 375. Mix both flours, salt, and sugar in the bowl of a stand mixer. Add the butter and blend. Add the egg and enough ice water to make a dough that is soft and silky. Roll the dough into a ball and wrap it tightly in plastic wrap. Chill for 30 minutes. When ready to use divide the dough in half. Roll each half on a lightly floured surface into a 14-inch circle. Line the tart shell with one rolled-out half and trim the edges even with the top sides of the tart pan. Fill with the ricotta filling. Cut the second sheet of dough into lattice strips and top the pie pinching the edges. Bake for 45-50 minutes or until a toothpick comes out clean. Pour the rice, vanilla and milk into a 1-quart saucepan, cover, and bring to a boil Cover with a tight fitting lid, reduce heat and simmer for 15 minutes, until all the milk is absorbed. Let cool in covered pot for an additional 10 minutes, until rice is soft. In a mixer bowl, beat the ricotta cheese, eggs, orange and lemon zest, and sugar until smooth. Add the vanilla extract and cinnamon. Fold in the cooled rice and pour into prepared pan. I received product, coupons and/or compensation for posts featuring this product. As always, all opinions are 100% my own. Sounds like a carb-o-licious dessert! I love anything with citrus, so this is right up my alley! Sounds wonderful! I love this sweetened version with cinnamon and citrus. Perfect for entertaining. Sounds good to me! I love citrus! What a fascinating pie! I'm Italian-American, but I've never heard of it before. It's like rice pudding pie form. Yum. I have never heard of Italian rice pie, but am always glad to learn about foods I have never heard of before. This looks like one I may need to veganize! I have never even heard of rice pie - looks absolutely delicious! I have never heard of rice pie but it looks delicious! 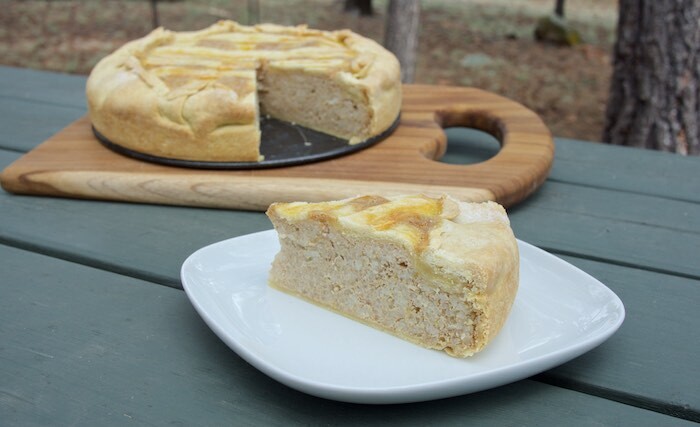 My husband's grandmother used to make a similar rice pie. I just got the rice, but it is for 10! I can't imagine what I will do with 10 rice pies, LOL. You are motivating me to make them. What a great way to experiment with the Basmati rice! I've never made rice pie before! I've never heard of it either but I love finding new recipes like this! I come from an Italian family and grew up with this pie every Easter and Christmas! This looks intriguing - your recipes are always genius. I need to give this a whirl. Wow -- it looks so fancy! I never would have thought to put rice in cake!! I've never heard of a rice pie, and when I read the recipe title I thought it was going to be a savory dish. I'm a little surprised to find that it's a dessert. It sounds really good!